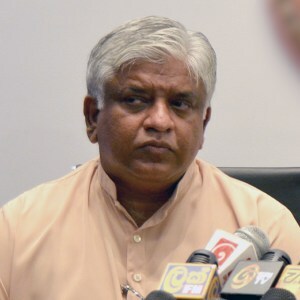 Tough action will be taken against private bus operators if they decide to go ahead with the strike causing inconvenience to commuters during the festive season, Transport and Civil Aviation Minister Arjuna Ranathunga said. “We even will not hesitate to cancel the route permits of private bus operators taking part in the strike, specially during the festive season,” he said. “We urge trade unions to abandon the trade union action and come for discussions. We do not agree their strike action as it will cause much inconvenience to the people” the Minister said. Minister Ranathunga further said that fines have been increased in order to minimise the road accidents caused by reckless driving. We cannot allow them to go on with irresponsible reckless driving any more. “The increased fines are not only imposed for private bus drivers, but also applicable to all citizens including my self. It is wrong to go for strike action during this festive season. We know there are political influences behind this strike,” he added. “We have past experience how the stranded commuters attacked striking workers during the previous train strike. We warn the strikers to give up the strike otherwise the commuters will teach them an unforgettable lesson,” he said. Meanwhile he All Island Private Bus Employees Association (AIPBEA) yestertday said that they would launch a 24-hour countrywide token strike with effect from midnight today against the government’s decision to increase spot fines up to Rs.25,000.